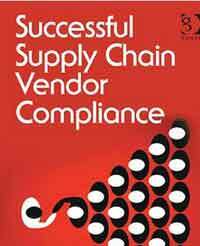 We're back this month with some more highlights from Norman Katz's new book "Successful Supplier Chain Vendor Compliance," from what we can tell the first work of its kind. There is a lot more in this informative book, which we think should be on every retail compliance manager's desk. In chapter 2, Katz discusses how frequently vendor performance should be measured within scorecard type programs. The answer, he says, is it depends, considering how long a retailer has been working with a given vendor, purchase order patterns, and more. On the latter, if a vendor is only receiving a few POs per month, then weekly scorecarding obviously makes no sense, Katz notes. That said, new vendors should be measured more frequently then established ones, even on a PO by PO basis, Katz says, and performance feedback should be as near real-time as possible. However, "As vendors prove their ability to comply with requirements and their KPI grades maintain high marks, the customer enterprise may decide to extend the cycle of scorecard reporting on certain metrics," Katz says. Along those same lines, Katz argues that while near real-time feedback on problem POs/deliveries is important, retailers need to look at the big picture with established vendors, and not over react to an issue with a given shipment. "By lengthening the of the cycle by metric by vendor based on the retailer's confidence in the vendor, the enterprise is essentially providing the leeway or breathing room for its well-performing vendors that don't need close monitoring all the time," Katz writes, saying the vendor scorecards should be segmented by "volume, velocity and confidence." On chargebacks, Katz says they "should be based on the actual infraction and the cost of administering the infraction." While Katz is strongly in favor of fair chargebacks, he has some slightly different thoughts on this than many retailers, writing that, for example, retailers might consider waiving even legitimate chargebacks if a vendor hits say 95% of a given measure over some period of time. This approach, he says, will not penalize high performing vendors for an occasional mistake. The alternative view of that, of course, is that if even a high performing vendor executes on a given purchase order in a way that costs the retailer money, the vendor should make the retailer whole for that shipment through a chargeback. Katz does not really analyze that view of the issue. Katz also says he has seen cases where inaccurate chargebacks are created based on errors by retail associates in the DCs. Of course, such errors can largely be eliminated by the top vendor compliance management tools, through enforcement of process, collecting evidence (pictures), promptly notifying the vendor of the violation and the evidence, etc.